Luxembourg with its capital Luxembourg is located in Europe (Western Europe, between France and Germany). It covers some 2,587 square kilometers (slightly smaller than Rhode Island) with a population of 594,130. Luxembourgish, German and French are the languages spoken by people in Luxembourg (consider regional differences). Belgium, France and Germany are bordering countries. Luxembourg is a landlocked country in the Benelux bordered by Belgium, France and Germany, lying at the crossroad of Germanic and Latin cultures. In autumn, many villages along the Moselle river organise wine-tasting village festivals. The streets and landscape in Luxembourg make for good biking territory; highly recommended. Be wary, though, of small-ish bicycle repair shops in rural corners of the country -- they may quite well charge you quite some money for fixing your bike when they actually break it, more or less subtly. The topography is mostly gently rolling uplands with broad, shallow valleys with uplands to slightly mountainous in the north as well as steep slope down to Moselle flood plain in the southeast. The average density of population is about 230 per km². The climate in Luxembourg can be described as modified continental with mild winters, cool summers. Potential natural disasters are occasional flooding. To reach someone Luxembourg dial +352 prior to a number. The local cellular networks are operated on 900 MHz, 1800 MHz, 3G, 4G. Websites typically end with the top level domain ".lu". If you want to bring electric appliances (e.g. battery chaarger), keep in min the local 230 V - 50 Hz (plugs: C, F). The sign for the locally used currency Euro is EUR. Three equal horizontal bands of red (top), white, and light blue; similar to the flag of the Netherlands, which uses a darker blue and is shorter; the coloring is derived from the Grand Duke's coat of arms (a red lion on a white and blue striped field). 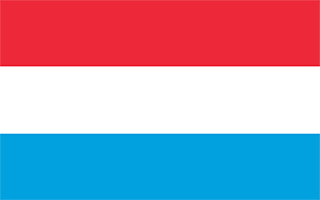 Founded in 963, Luxembourg became a grand duchy in 1815 and an independent state under the Netherlands. It lost more than half of its territory to Belgium in 1839 but gained a larger measure of autonomy. In 1867, Luxembourg attained full independence under the condition that it promise perpetual neutrality. Overrun by Germany in both world wars, it ended its neutrality in 1948 when it entered into the Benelux Customs Union and when it joined NATO the following year. In 1957, Luxembourg became one of the six founding countries of the EEC (later the EU), and in 1999 it joined the euro currency zone.